How do we use Alberta’s land and resources now and in the future? How do we make the best decisions for long-term respect for Alberta’s environmental, economic and social wellbeing? These are the complex questions that are at the foundation of land use planning. In Alberta, land use planning is guided by the Land-use Framework, the Alberta Land Stewardship Act and seven regional plans. Alberta’s Land-use Framework contains seven strategies to manage public and private land and natural resources. It is considered a blueprint for land use management and policies. The Alberta Land Stewardship Act sets out the legislation for implementing the strategies and meeting the goals from the Land-use Framework. One of those strategies is developing regional plans for seven regions in the province that define the strategic direction for the next 10 years. 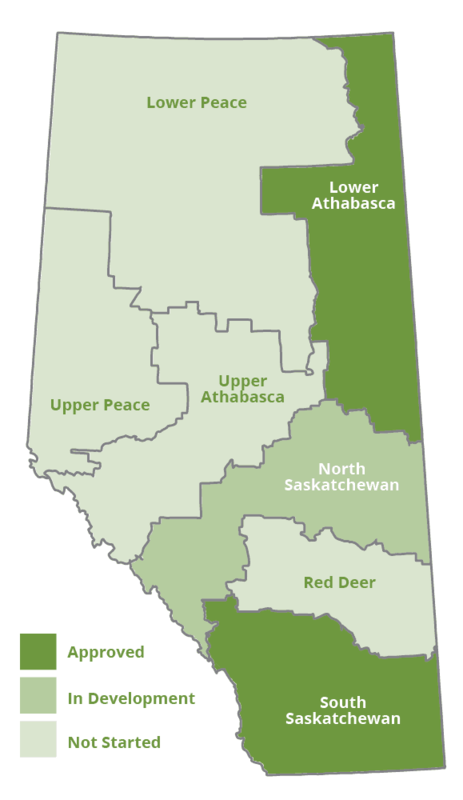 Two regional plans (for the Lower Athabasca and South Saskatchewan regions) are completed. Alberta is a growing province where industrial and municipal development, recreation, agricultural production, and conservation compete on the same landscape. Smart choices must be made about how the province grows and how land is used in order to maintain all of our advantages – natural resources, plentiful jobs and a beautiful and diverse landscape. Regional planning in Alberta is built on the foundation to balance development and create a framework for future land-use decision while encouraging stewardship, conservation and information sharing about the cumulative effects of multiple uses on the land. Regional planning provides the basis for policy integration while increasing direction and clarity to guide land-use decision-makers while collectively working towards the values set out by Albertans. Regional planning will not replace local decision-making, but helps to ensure that there is alignment on strategic issues and plans, recognizing that there is a limited capacity of airsheds, watersheds and land disturbances which cross multiple jurisdictional boundaries. Determining the best use of land and resources is a complex decision that has been guided by regulations and policies since the early 20th century in Alberta. The current strategies and regulations are based on a new approach started in 2008. Developed by the Land-use Secretariat, the Land-use Regional Plans Online Compliance Course covers the framework, governance and compliance of Alberta’s regional plans. News, research updates and events from our partner website. The Land Use Secretariat supports the development and interpretation of Alberta’s regional plans. Blueprint for land use management and decision making. View the Land-use Framework. Legal basis for land use planning in Alberta. View the Alberta Land Stewardship Act. Effective on September 1, 2012. Learn more about the LARP. Effective on February 16, 2014. Learn more about the SSRP. See more information about the current status of Alberta’s regional plans. Prepare context statements outlining how their municipal development plans will align with and address provincial directions stated in regional plans. Amend municipal planning documents to adopt and align with regional planning directions. The foundation to evaluating decisions is information. Explore information, maps and data from around Alberta. The Land-use Regional Plans Online Compliance Course was developed by the Land Use Secretariat and is hosted by the Alberta Land-use Knowledge Network. It is an introduction to regional planning in Alberta and related compliance requirements specified in the Alberta Land Stewardship Act. For Albertans interested or participating in regional land-use planning, complete the Online Compliance Course to understand the province’s regional plans. Follow the latest news about land use planning in Alberta, including news and government updates. Read stories about practitioners working in Alberta in our Articles. News, research updates and events can be found in the Alberta Land-use Knowledge Network, our partner site.